iPhone 6 Screen Replacement White, Giorefix 4.7 Inch LCD Display Touch Screen Digitizer Frame Assembly with Full Set Repair Tools Screen Protector for iPhone 6 Display White by Giorefix at Got Busted Mobile. MPN: 43235-18449. Hurry! Limited time offer. Offer valid only while supplies last. 【PERFECT COMPATIBILITY】 iPhone 6 screen ONLY fit for iPhone 6 (Model: A1586, A1589, A1549) 4.7 Inch, NOT compatible for 6s 4.7inch and 6s plus 5.5inch, please check your phone model before purchase and install. 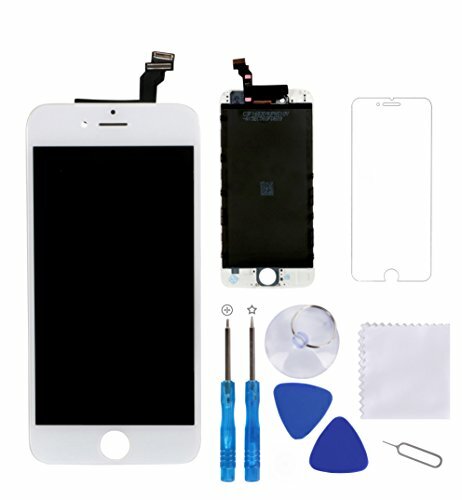 【GREAT REPLACEMENT】iPhone 6 replacement screen to replace your old, broken, cracked, damaged LCD touch display, repair faulty screen:display problems,dead pixels,touch response issues and wrong colors,give your phone a brand new look. 【PROFESSIONAL INSTALLATION】We will share professional installation video with customer that helps install easier, all the required iPhone 6 screen repair kits are included in the package. Helps you fix your phone faster. 【FREE GIFT FOR YOU】iPhone 6 digitizer comes with the 9H hardness tempered glass screen protector ,extra protection for your new screen. Full set repair tools help you save time. 【WARRANTY】6 Months for non-human factors. There is a 100% inspection for each screen before shipment. We provide technical support and after sale service to make your purchase risk-free. If you have any questions about this product by Giorefix, contact us by completing and submitting the form below. If you are looking for a specif part number, please include it with your message.